What makes The 12 Week Emotional Eating Recovery Program unique? Most weight loss programs focus exclusively on reduced-calorie eating plans and exercise regimens. They attempt to apply external solutions to internal problems and fail to address the main cause of weight gain: overeating driven by emotional and spiritual hunger and physiological imbalance. Most emotional eaters are unable to stick with suggested eating and exercise plans because they have imbalances that derail their best intentions. The seemingly simple act of overeating is actually quite a complex behavior. Its resolution requires a comprehensive, multidimensional approach. When we eat in the absence of physical hunger cues, regularly consume unhealthy comfort foods or eat when we are already full,something is out of balance somewhere. I created the 12 Week Program and wrote both books because I wanted to offer an alternative to dieting that would address these mind, body and spirit imbalances. The Program features simplicity and step-by-step direction. You will be gently guided through the mastery of five self-care skills, five body-balancing principles and five-soul care practices (as outlined in my first book) that can put an end to overeating and dieting forever. The skills learned will help to re-wire your brain. Weight loss, better energy, improved health and self-esteem will naturally follow. Why should I sign up for the 12 Week Program as opposed to just reading the books? You may find it easier to learn and implement the skills, principles and practices when led by a recovered emotional eater and expert mentor. I have been running The 12 Week Program for twenty-six plus years. And the support and collective wisdom of the group and group process can be profoundly transformative. In addition, there are topics covered and homework assignments given in the program that are not included in the books. What if I don’t have much weight to lose but think I’m an emotional eater? Would the Program still be right for me? Yes. Whether you’re trying to shed those last few pounds, lose a large amount of weight, end a compulsive overeating problem or just improve your emotional, physical and spiritual health, the Program will offer exactly what you need: information, examples, clinically proven techniques, guidance, encouragement, consistent practice and a program that can be utilized for life. The Program can be universally applied to anyone who: regularly overeats, makes unhealthy comfort food selections, finds it difficult to stick to a healthy eating plan and wants to improve their emotional, physical and spiritual health. How does the telecoaching program work? Before the program begins, you’ll be sent instructions, via email, for calling in at a particular time each week to listen to a recorded lecture. You can replay this recording at your convenience anytime during the following week. The first lecture of the series will be live, with me, Julie. You’ll be guided through various written exercises during the lecture each week. At another time that same week (generally Saturday or Sunday mornings), you will take part in a 75-90+ minute (depending on group size) live group coaching phone session with me. This will be the time for asking questions and working on the skills, principles or practices outlined in the lecture that week. The coaching teleseminar option is great for people living outside Los Angeles or those who have time constraints and cannot make it to a live group each week. If you miss a coaching call, you can replay it at your convenience. What is the difference between the live program and the telecoaching program? The live program involves meeting in person, generally in my office, one time per week for 90-120 minutes (depending on group size) of combined lecture and group process. You get the benefit of working with me in person and processing in a live group. These sessions are not recorded and there are no make-ups. You are responsible for paying for all twelve sessions (telecoaching and live) whether you attend every one or not. 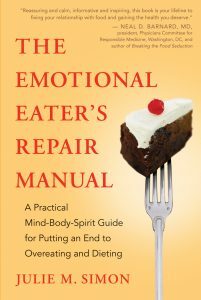 In the live program, we will work from The Emotional Eater’s Repair Manual and When Food Is Comfort plus a handbook provided to you. In the coaching teleseminar series, we will work from both books plus extra handouts (sent to you via pdf documents.) You will need to purchase the books separately. Yes, there will be in session exercises and homework to complete each week. The only way to learn new skills is to practice them weekly. The assignments will increase your awareness and help you master the self-care skills and soul-care practices and correct body and brain imbalances. I won’t collect your homework; it is up to you how much or how little you do each week. If I select the three-payment option, when are the payments due? To hold your space for the live program, the first payment is due 10 days before the program begins. For the teleseries, the first payment is due before the first session. For both programs, the second payment will be due during the first week (cash, check or billed to your credit card) and the third and final payment will be due during the second week of the program. For the live and telecoaching program, the materials fee is included in the first payment. What kind of refund policy is there? I’m committed to providing you the highest level of satisfaction when taking this program. If you find within the first 7 days from the program start date that you are not satisfied with the program, you may request a prorated refund of your payment less a $100 processing charge. Refunds will be issued in the same form of payment made and may take up to three weeks to process. No refunds are allowed after the first 7 days. Materials fees of $85 are non-refundable. Refund requests must be made in writing to Julie@overeatingrecovery.com. How do I know if I’m an emotional eater? Doesn’t everyone eat emotionally? • you try to fill up an inner emptiness with food. Can I be an emotional eater if I don’t binge? Yes. Every emotional eater is as unique as his or her fingerprint. While many emotional eaters binge on a regular basis, many do not binge. A binge is defined as consuming a large quantity of food in a short period of time with a feeling that your eating is out of control. Eating is often done in secrecy so that others will not notice. Binge eating is the most serious type of emotional eating and is the main characteristic of two eating disorders: binge eating disorder and bulimia nervosa. Even if your eating doesn’t have a compulsive component to it, if you regularly eat when you’re not hungry (this includes snacking mindlessly) or when you’re already full, or if you regularly choose to eat unhealthy comfort foods, the bulk of your overeating is most likely emotionally driven. What exactly is emotional hunger? Emotional hunger represents an appetite, a craving or a desire to eat, in the absence of true physiological hunger cues. Emotional hunger often feels the same as physical hunger. Generally, an appetite, without true hunger cues, represents an exaggerated desire for pleasure, soothing, comfort, fulfillment, excitement and distraction. How does one become an emotional eater? What most emotional eaters have in common is that their early family experiences were under-nourishing, at best, and at worst, chaotic or traumatic. For a variety of reasons many emotional eaters have grown up in environments where their basic physical and emotional needs were inadequately met. Their caregivers may not have had their basic needs met and may have been incapable of meeting their children’s. Even well meaning, loving caregivers can be overly self-absorbed or needy and regularly distracted by their internal struggles. They may have had a physical or mental illness. Perhaps they were angry, anxious, depressed, controlling, hypercritical, indifferent, unpredictable, overindulgent or overprotective. When our emotional needs go unmet, we are forced to spend much of our precious childhood years trying to cope with unpleasant emotional states, insecurity and low self -esteem. Our emotions and needs are neglected and we lose touch with these important internal signals. 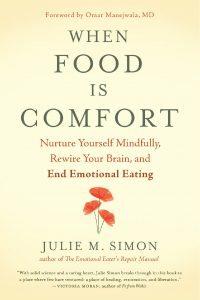 It’s easy to see how we can begin to use food for comfort, pleasure and calming. Unlike our neglect-filled or chaotic family environment and inner world, food is soothing, readily available and predictable. We can easily become over focused on food and eating. Our development, like a train, goes “off-track” and gets derailed or even arrested. Rather than acquiring necessary self-care skills, we end up with skill deficits, which unfortunately can have life-long consequences. We grow up with an emotionally starved inner child running our lives. What causes the physiological imbalances that drive overeating, since not all overeating is due to emotional or spiritual hunger? • High stress, 24/7 over stimulating, sedentary urban lifestyles downplay the need for proper exercise, rest and sleep. Can you define spiritual hunger? Emotional eaters often feel disconnected from the deeper reserves of joy, passion and contentment within and from their “higher self” or a “higher power.” Many feel disconnected from their “calling” or sense of purpose in life and they may also feel disconnected from other nourishing human beings or from nature. Spiritual hunger represents a longing or yearning for peace, joy, inspiration, passion, purpose and meaning. It may involve a desire for transcendent experiences that help us gain a more expansive perspective and connect us to something or some force greater than ourselves. Even when we’ve achieved our desired weight loss, improved our health and our lives seem relatively full we can still experience symptoms of spiritual depletion. What are some of the signs of spiritual depletion that emotional eaters can watch for? • general sense of discontent or dissatisfaction and a sense of being lost in life. Is it truly possible to stop emotional eating once and for all? How long does it take? Yes. I did and everyone else can too. The 12 Week Program offers a way out of dieting and a once-and-for-all resolution to emotional eating. Restrictive dieting has offered you a way to periodically put on the brakes, gain a sense of control, and lose some weight, but it doesn’t lead to a permanent solution. And the constant focus on food, weight loss, and body image crowd out joy and vitality and replace them with vigilance, anxiety, and frustration. For most overeaters, the causes that underlie their overeating or imbalanced eating and weight gain have existed for a very long time. It will take some time to resolve them. This approach will require a shift in your thinking, a longer-term perspective, and a loving commitment to yourself. While some people do lose a significant amount of weight in this relatively short time period, weight loss is not the goal of the program. It’s best if you can shift your focus to gaining skills and practices rather than to losing weight. Over time, the weight will come off and stay off. And losing weight tends to be somewhat effortless with this approach. Were you once an emotional eater? Yes. I know firsthand how frustrating overeating and gaining weight can be. I spent a good portion of my life stuck in a cycle of overeating comfort foods, gaining weight, dieting and over-exercising. I definitely ate emotionally — I used food to calm and soothe myself. It helped numb the pain of unpleasant emotions, self-doubts and other negative thoughts, and general stress. Food altered my brain chemistry; and because food is pleasurable and exciting, it was a good distraction. It temporarily filled up the inner emptiness and restlessness I regularly felt, a sort of spiritual hunger. I was raised in a dysfunctional family environment and I entered adulthood missing many basic self-care skills and what I call “soul-care practices.” And to add insult to injury, I had inherited body and brain chemistry imbalances that made highly processed comfort foods and stimulants, like caffeine, both attractive and addictive. It took many years of study, therapy, and visits to health care practitioners for me to understand and resolve all the pieces of the overeating puzzle in my own life.